If you were to open the middle, right drawer of my office desk you would find among other items a 16.3 ounce jar of Peter Pan Creamy Peanut Butter. For emergency purposes. When my I get the shakes because my blood sugar drops, when I forget my lunch, or when I just need a little more fuel to make it through the race, I grab my trusty peanut butter. Call me weird. Be a PB hater. Won't bother me, because it works for me. Protein & carbs with a bit of fat. Peanut butter is cheap fuel to run on. 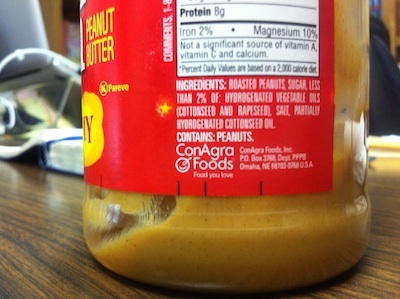 Interestingly enough, under the ingredients on the right side of the label, just above the ConAgra Foods logo you'll notice the bold print phrase, "CONTAINS: PEANUTS." It's an anomaly of our country's food safety labeling. If you have a nut allergy - those can be scary & severe - then you want to know about even a trace of nuts in any food. You, the mindfully allergic consumer, would skip the peanut butter altogether. But not the FDA. Or deep pocket liable ConAgra. If any product has got peanuts in it, "CONTAINS: PEANUTS," goes on the label. Even in peanut butter. So, yes, thank you, for labeling for safety's sake that peanut butter CONTAINS: PEANUTS. The Bible, when it comes its doctrines, contains teachings that seem to cause allergies. If the FDA regulated Bibles, I'm sure each copy would come with a warning label - maybe even embossed nicely into the back cover of leather-bound copies - of all the potentially allergic teachings. Stewardship - the concept of giving back to God a portion of what He has given us since He is the Owner & Provider & we are only stewards or caretakers of all He has entrusted - is in the Bible. So, yes, thank you, for Christ-follower's giving sake that the Bible CONTAINS: STEWARDSHIP.